Important Instructions - 1. This ration cannot be used for any purpose other than that which it was applied for and issued. 2. They type and serial numbers of coupons in this folder must be the same as those shown on the front cover. 3. Within five days after discontinuance of the use for which this ration was issued, this folder and all unused coupons must be returned to the War Price and Rationing Board. 4. 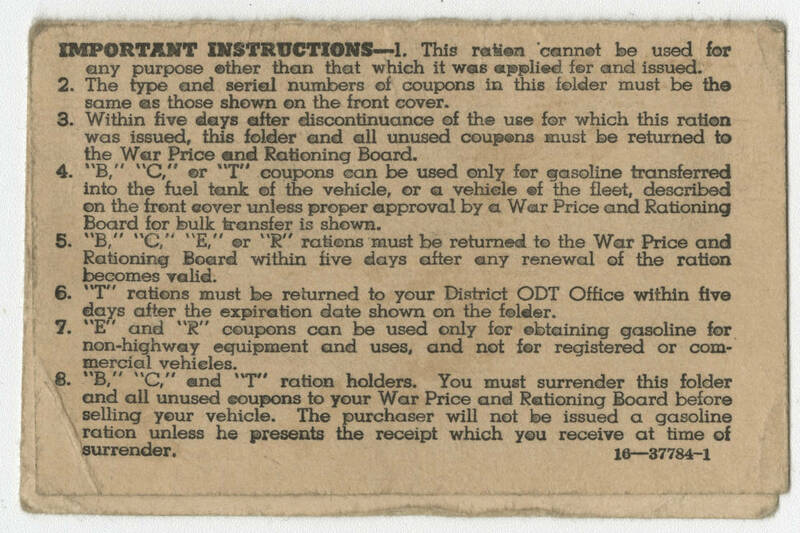 B" "C" or "T" coupons can be used only for gasoline transferred into the fuel tank of the vehicle, or a vehicle of the fleet, described on the front cover unless proper approval by a War Price and Rationing Board for bulk transfer as shown. 5/ "B" C" "E" or "R" rations must be returned to the War Price and Rationing Board within five days after any renewal of the ration becomes valid. 6. "T" rations must be returned to your District ODT Office within five days after the expiration date shown on the folder. 7. "E" and "R" coupons can be used only for obtaining gasoline for non-highway equipment and uses, and not for registered or commercial vehicles. 8. "B" "C" and "T" ration holders. You must surrender this folder and all unused coupons to your War Price and Rationing Board before selling your vehicle. The purchaser will not be issued a gasoline ration unless he presents the receipt which you receive at the time of surrender.